Wisconsin Arts Board Grant Helps Fund Guest Teachers at LOLA! - Land O' Lakes Area Artisans, Inc. This spring, LOLA was pleased to receive a grant from the Wisconsin Arts Board with funds from the State of Wisconsin and the National Endowment for the Arts. This grant helped to fund new guest artists to teach at LOLA as well as new classes for our busy summer season. Read on to learn about the new classes LOLA was able to offer! 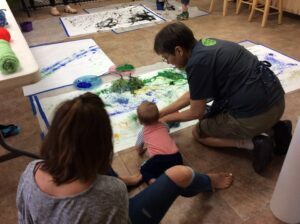 Debbie engaging with a young artist during Toddler Tuesday. Art class for toddlers ages 3 and 4 are still in session and are held each Tuesday, June 13 through August 8. Toddlers must be accompanied by an adult and cost is $10 each child, with no fee for the adult guardian. Experiential classes, inspired by the Reggio Emilia method of early childhood education will be the focus for Toddler Tuesdays. The Reggio Emilia method, a project-based approach to early childhood education that encourages children to explore. According to the North American Reggio Emilia Alliance, this method has been found to be beneficial in teaching children how to cooperate, solve problems, and resolve conflicts. This method is also well-suited to children and adults learning and experiencing new ideas together. Three different art stations and activities will be offered each week. Adult guardians are participants and can expect to come away with ideas to work with their child at home. Debbie Jircik is a clay & paper artist, who is now specializing in her garden grown dye plants that she incorporates into hand-made papers, eco dyed & printed silk scarves and other fabrics. As a leader in fiber arts, she has been invited to an intensive study of traditional indigo dyeing processes in Japan this fall. Carol’s Kirigami tree from “Beauty of Trees” class. Retired environmental science teacher, Carol Mason of Minnesota led three classes that taught children about the importance and beauty of trees, birds, and bats. The value, biology, symmetry & poetry of trees was discussed in the first class. Classification, anatomy & identification of birds was next, and Carol finished her sessions demystifying bats and discussing their characteristics and benefits. Each session ended with an art project focused on the topic. These classes were suitable for ages 7 and up. LOLA Welcomed Nina Fiorucci Back to the Art Room for Two Special Classes. Nina’s Faux Batik on paper. Miss Nina (as she is fondly known by her students) was LOLA’s first summer teaching intern. She now teaches art to high school students in the Detroit, MI area and continues to do her photography. This summer she will travel to Italy for a special art photography workshop for which she received a large grant. For her LOLA class, Nina focused on recycled materials for making Quirky Birds and also taught a Faux Batik on paper class. Artist, Illustrator – Leigh Cox of Ohio Lead a Drawing Workshop: Birds of Prey & their Super Powers! Join self-described “bird nerd”, Leigh Cox talked about birds of prey and their special “super powers”. Students then created and drew their own “super bird” with any powers they could imagine. Leigh Cox is an illustrator currently based out of Marietta, Ohio by way of Chicago. She specializes in stylized editorial content combining traditional technique with modern subject matter. Leigh received her BFA from The Art Institute of Chicago in 2006 with a focus in natural history illustration. The Summit Players Theater company will arrive at LOLA on July 23 for a Children’s Shakespearean Workshop. Summit Players conducting a Shakespeare Workshop earlier this year with LOLA & LOL Elementary. This event is coming up! The Summit Players will be back in Land O’ Lakes direct from their tour of free performances in the Wisconsin State Parks. This special workshop will focus on learning about Shakespeare, his works, his language & Elizabethan Theater. Children will be invited to recite lines from a variety of plays in a lively game of “scrolls”. This will be a FREE event held on the LOLA deck Sunday, July 23 from 1 p.m. to 3 p.m. Suitable for all ages…even adults who are young at heart! Click here for more info.